Hello and welcome back to the Project SR E30 series! In this episode, we will be addressing the last few issues holding us back from finally installing the engine once and for all. You may recall that previously, we got a brake booster that fit with the SR, but we never actually made the brake booster function. Today, we will modify that brake booster to work, as well as address some exhaust clearance issues. We will also perform the final preparations to the SR before installation. First things first, since this car is going to be a street car, we’re putting the heater lines back in. Funnily enough, the heater core inlet on E30’s is on the drivers side of the car, just like JDM S13’s. We can just use the cross-over style heater hoses that come installed on your SR when you get it from Japan. 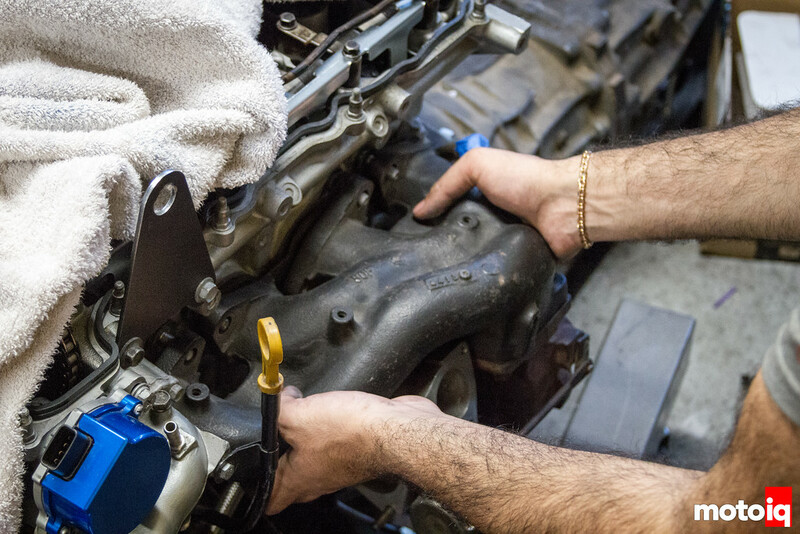 Installing the heater hoses is a lot easier if you remove the intake manifold first. We also scored an ACT Lightweight flywheel on craigslist for $20!!! It was in pretty rough shape, but nothing a quick trip to the machine shop can’t fix. We quickly popped the trans off to install the flywheel. We’re using an ACT 6-puck sprung clutch with a heavy-duty pressure plate on this engine. You might remember from part 1 that we had to use a very special tubular unequal length manifold in order to clear the brake master cylinder. Well, before installing the engine, we decided to redo the heat wrap on it. We cut off the old heat wrap and…. DISASTER!!! This manifold is almost cracked in half!!! No wonder the car sounded like crap! We searched and searched, but unfortunately we could not find another unequal length manifold ANYWHERE. After crying ourselves to sleep, we settled on installing a stock manifold. On the plus side, this stock manifold has even more brake master clearance than the old unequal length manifold. 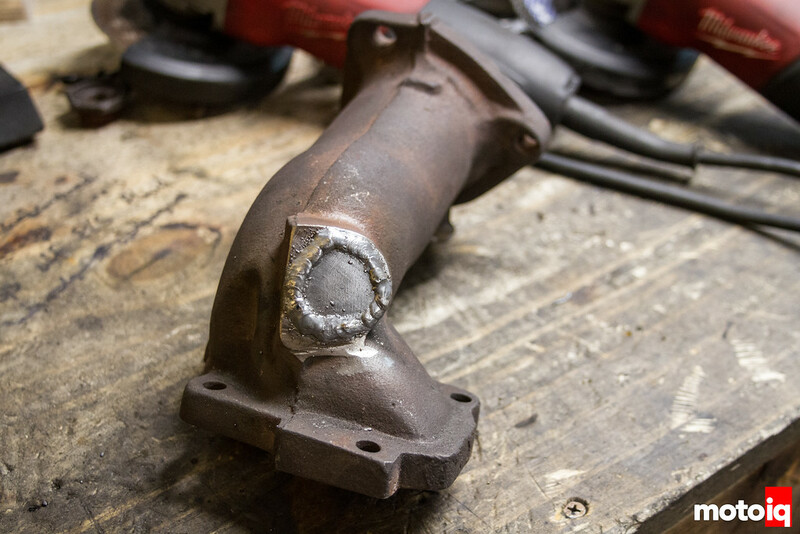 We also picked up this stock turbo elbow. 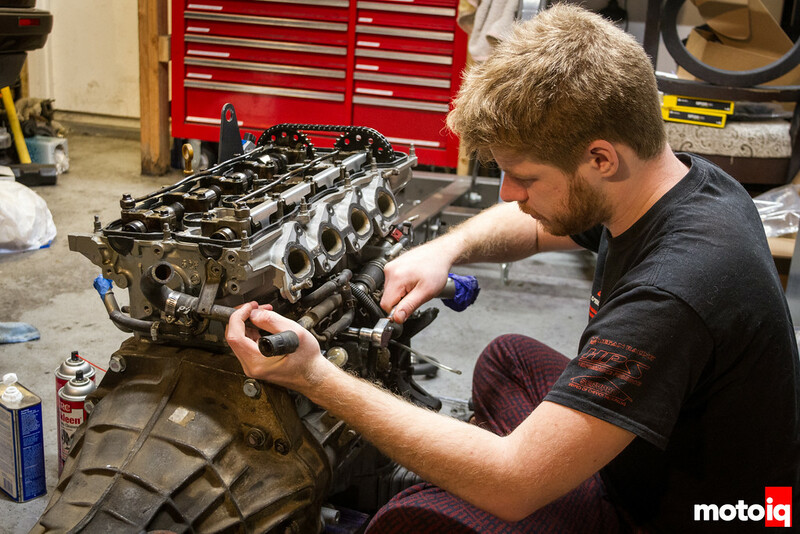 We figured that it would give us the best shot of clearing the steering linkage. We just had to chop off and weld shut part of the O2 sensor bung to make it clear the brake booster. Love this series, great read and excellent photographs! Hey just a heads up: when using a bolt and nut with Nord-Lock washers, you require a Nord-Lock washer on the bolt and the nut. There was a video posted up by the Nord-Lock group explaining how and when to use their washers. Looks like you only have one on the nut. Wow, good catch! You’re absolutely right. We need to fix that. Are there any special considerations for using a brake booster from and NA on a turbo car? I’m finding very little information on this topic. I’m installing a B210 brake booster on my 4G63 turbo swapped Datsun 510. Although this booster swap seems common in the 510 world, very few people have information to share about making it “turbo safe”. There is no difference between a turbo and non-turbo brake booster as far as I understand it. As long as there’s a check valve to prevent boost from entering, you’re fine. Thanks for the advice, we will definitely look into that. Currently we were planning on using DEI’s Form-a-Shield thermal barrier to help protect the brake master.